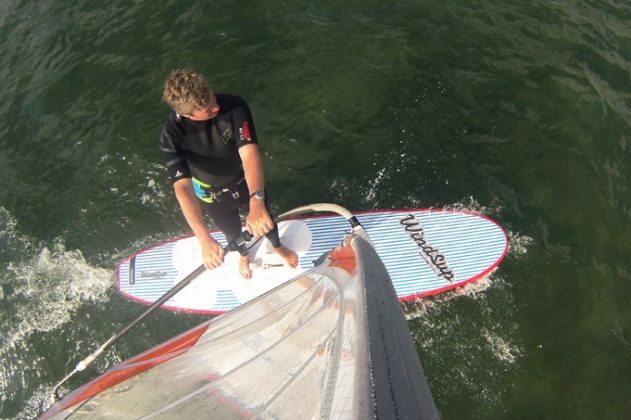 Marketed under the slogan of “windsurfing and supping in one”, the WindSup by RRD is one of the few remaining hardboards available on the market, dedicated to this transient role between the two sports. Whilst new for 2016, it actually has a distinctly traditional ‘windsurf long-board’ look and feel, with smooth rounded nose, long parallel rails and a squaretail. With a gentle dome the board’s deck, the rails taper significantly to their edge, whereas the rocker-line is flat throughout much of the board’s length, kicking-up late in the nose. The WindSup has an all over EVA deckpad, with its blue pinstripes and clearly marked standing area around the centreboard and footstraps. The footstrap positions themselves are placed well forward on the deck, providing a good idea of the wind strength and rider ability that the board is targeted towards. The centreboard incorporated is the ‘industry standard’ Allgaier system box, which is both easy to use and very hardwearing. Used in windsurf mode, the WindSup has a familiar and conventional feel underfoot, being directionally very secure and efficient. Any power that is pushed into it is translated into forward motion, and for the more accomplished rider, the board can be railed in light airs to point very close to the wind. As the wind increases the balance of the WindSup is excellent, with plenty of training strap options to help the intermediate progress seamlessly into planing conditions. The board has a low planing threshold and can pose as an excellent tutor – a real champion for masking over a hurdle that often seems insurmountable. At 76cm wide, it isn’t the most stable or easy for the complete windsurf beginner – fine for lightweight adults or kids, but a bit too tippy for the larger rider if the conditions aren’t absolutely idyllic. That said, the WindSup strikes the right note for most to enjoy its qualities – a real contender for the stereotypical scenario of a parent teaching their children the rudiments of the sport. In SUP mode, the WindSup glides beautifully, its extended waterline helping it to slip through the water silkily with every stroke. It has a classy feel about it, the EVA deck providing good traction and comfort for long periods whilst cruising. And whilst you don’t need the foostraps for SUPing, such is the balance of the board that you can stand either side of them without hindering the board’s trim, enabling it to transition effortlessly between the two sports.